Traditionally ridge gourd or its skin alone (!) has been used to make thuvayal. 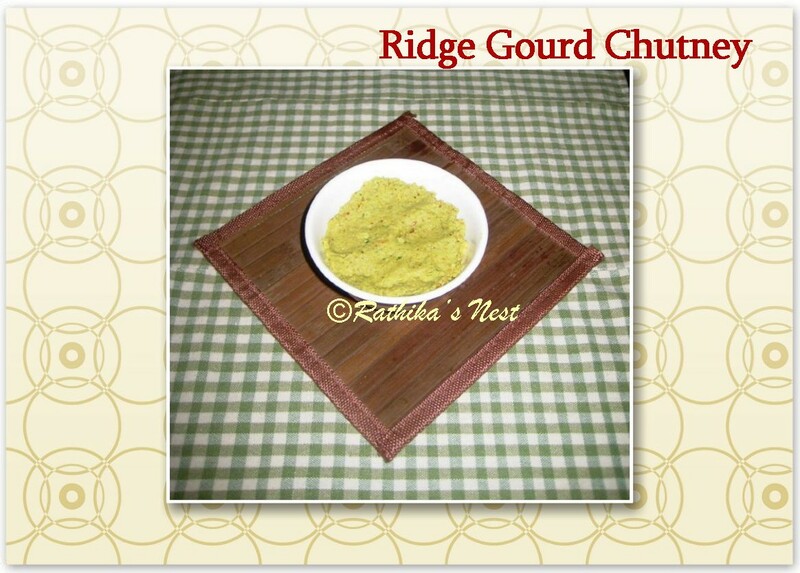 This chutney or thuvayal (பீர்க்கங்காய் துவையல்) makes a good accompaniment to curd rice or even rasam rice! Let me share the authentic traditional recipe with you. Method: Wash the ridge gourd well, cut off the ends and cut the vegetable into cubes. Heat 1 teaspoon of oil in a kadai, add red chilies and toor dhal. Fry till the dhal turns golden brown. Transfer to a bowl. Now heat the remaining oil and fry the ridge gourd pieces till the fleshy portion starts to become soft. Allow the vegetable to cool. Later grind the fried items, ridge gourd, coconut, tamarind, salt and asafoetida using a mixer-grinder into a smooth paste. Your chutney is ready!